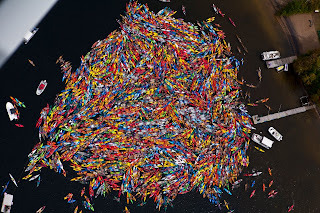 "The largest raft of canoes and kayaks consisted of 1,902 boats and was achieved at the event "One Square Mile of Hope". The event was sponsored by the Central Adirondack Paddlers Society, and took place on Fourth Lake in Inlet, New York, USA!" The photo got me to thinking, how many kayaks are there in the world right now? Probably lots and lots, maybe even millions, thanks to the miracle of injecting plastic into a mold. 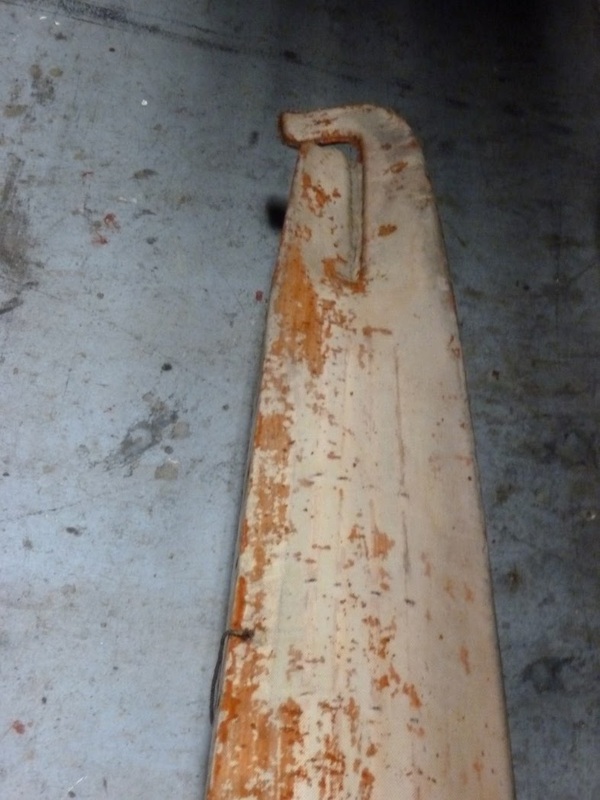 This is not intended to be a slam on plastic kayaks by the way. Even home built skin on frame kayaks in the world right now must come close to the number of skin kayaks that existed at the peak of population in the Arctic. Aleut population at its maximum was estimated to be about 20,000. Perhaps a third of that population was adult males each of whom supposedly had a kayak. 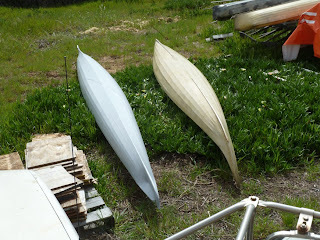 So at its peak, there were perhaps 7000 kayaks in the Aleutians. In a previous post I was musing on what makes certain posts more popular than others. I looked at the stats that google provides to the blogger in more detail and found that my initial suspicion was correct. The reason that the Iqyax^ and the Sea Otter post is popular is that it has pictures of cute sea otters. "sea otter" is the search term that brings the most visitors to my blog. It beats the next nearest search term "frilled lizard" by about a factor of 20. "Aleut paddle" as a search term in various combinations is about as popular as the frilled lizard. Another interesting statistic is that traffic was down over the Easter weekend but picked right up again on Monday. I'm not sure of this, but I suspect that a lot of people do their internet time wasting at work, that is, people who sit at a computer monitor at work. If you're working a cash register, stocking merchandise, driving a car or truck, busing tables or mowing a lawn or shoveling snow or pounding nails or pouring cement, then you probably don't visit my blog when you're at work. 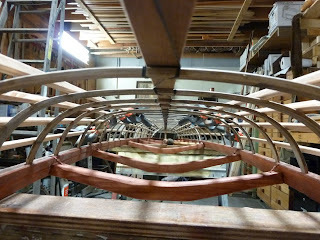 I am currently working on the improved Bay Boat, that is, San Francisco Bay Boat. 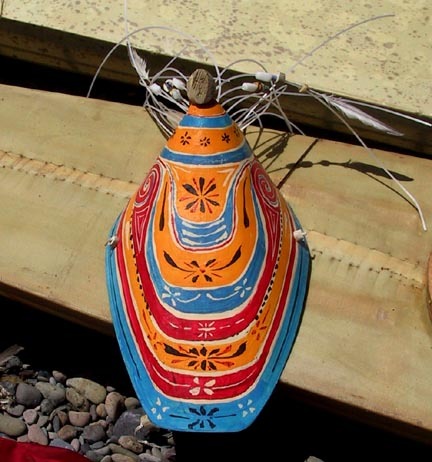 The baidarka I had been paddling most frequently is about 20 years old, re-ribbed once and reskinned a number of times and a fairly close replica of an Atka baidarka. This particular boat just got a paint job. 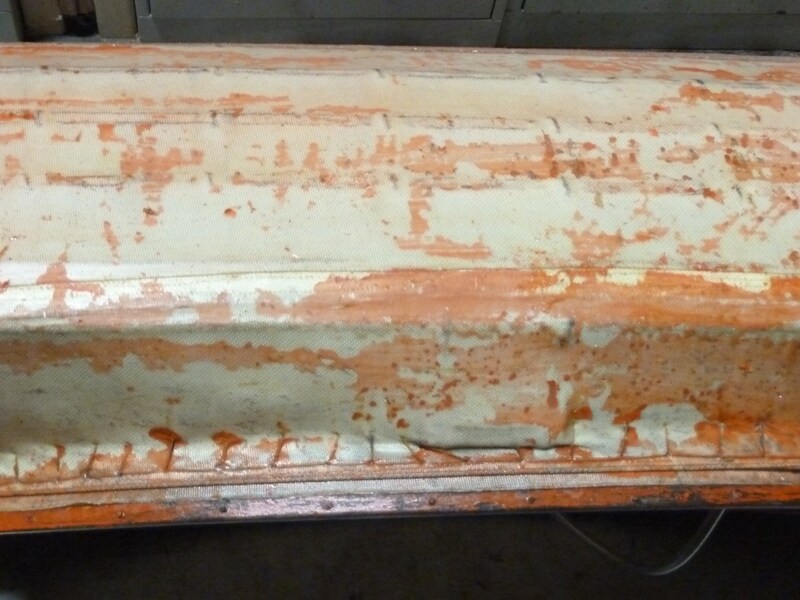 The old paint job consisted of a varnish base covered some time later by a color coat. The color coat was peeling badly, probably because I never sanded the base coat before putting on the color coat. The re-paint is done now. 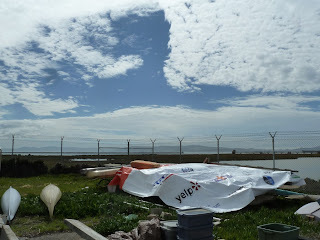 The baidarka is on the left with its new coat of gray latex house paint. 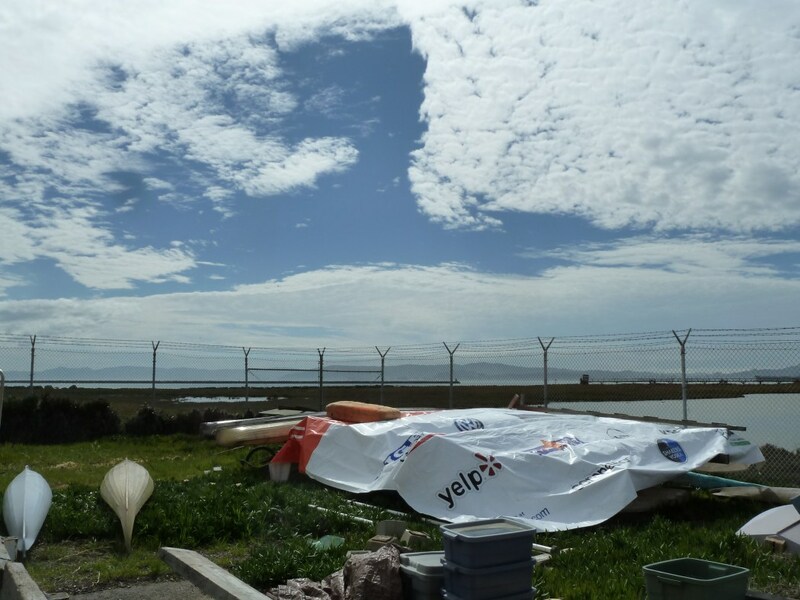 I store my boats outside so the most critical job of the paint is to keep the UV rays from degrading the nylon skin. Opaque paint does a good job of that and more cheaply than exterior varnish. That's my King Islander to the right of the baidarka. 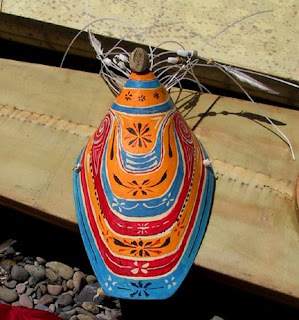 The only drawback of the old baidarka is its narrow width and fairly deep hull which makes it a challenge to keep upright. It's actually not that bad once you get used to it, but it's not a boat that you can just sit in and relax. When you're not moving, you need to brace or have the paddle out as an outrigger. So, enter a wider version of the Atka iqyax^. The idea behind this boat is sufficient width to allow lounging without constant bracing but not enough width to make it slow, a boat suited for longer stays on the water, like a bay crossing, about a one hour affair. 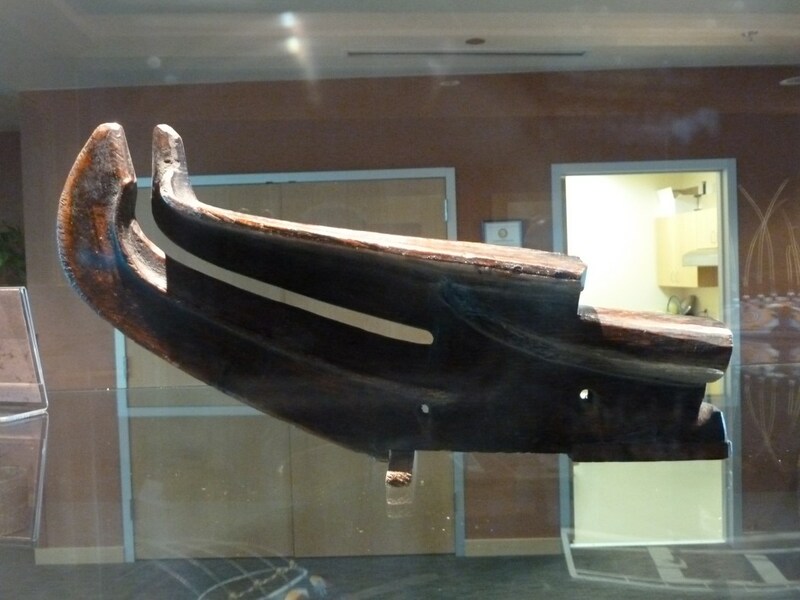 Inside view of the hull. 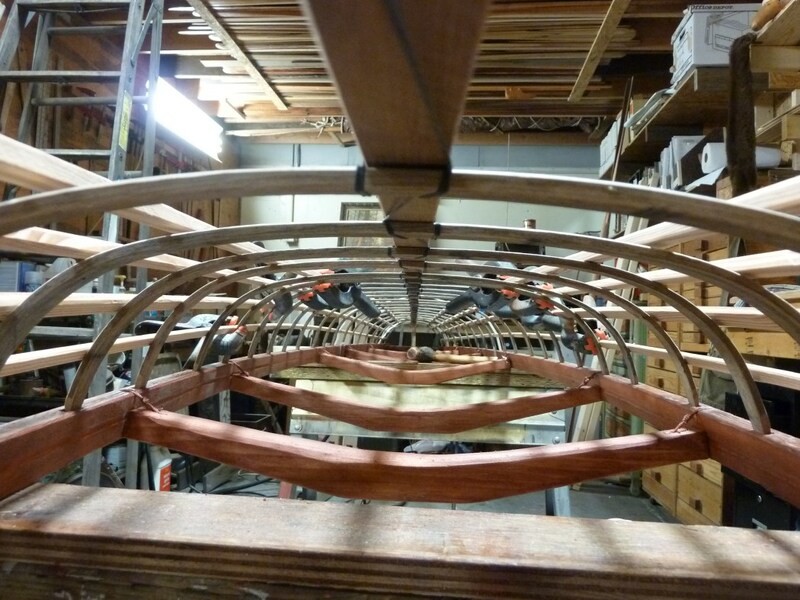 Good width and flat rib profile to make the boat stable. And an outside view of the hull with the stringers temporarily taped and lashed in place. 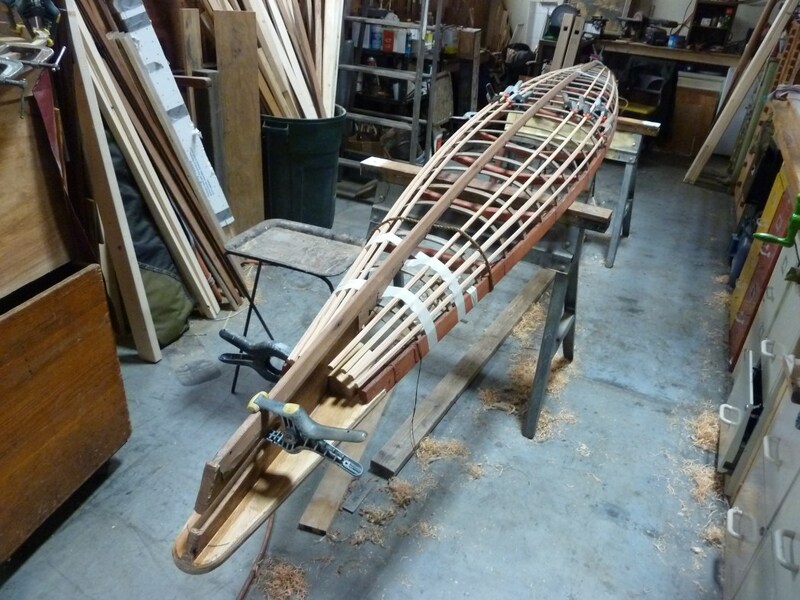 Also note the open jawed bow, a configuration I have been playing with, mostly because this configuration makes it easier to align the keelson with the bow assembly. Also the upturned nose of the other bow configuration is more prone to breaking because the grain runs across the upturned part instead of in line with it. One of the things that the Google blogger software provides you with is statistics on how many hits the blog gets. Aside from total page views, there is a ranking of pages in order of hits received. This particular statistic has always struck me as inexplicable - why do people go to one page more than to another? But I am starting to form some theories. First a list of the three all-time highest hit getting postings that I have made. Ready? Number one is The Iqyax^ and the Sea Otter with roughly 7000 hits. Number two is The Frilled Lizard Boat with roughly 1500 hits. And number three is Aleut Bent Wood Hat making with roughly 1000 hits. 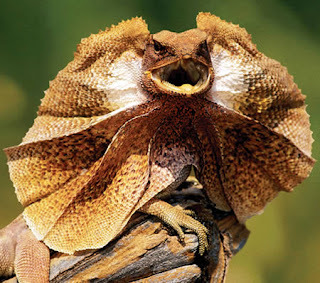 Until I posted about the sea otter, the frilled lizard page was the most popular. The reason I think is that somewhere in grade school, kids learn about funny looking animals and encounter the frilled lizard. So then they go on the internet and search for frilled lizard pictures for their school report and voila, they find my page. Same goes for the sea otter page. 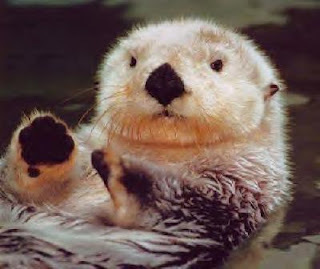 Sea otters are possibly the cutest animals ever and so any page with sea otters will get hits. Bent wood hat making has no cute animals in it, but this may also be a legitimate search topic in Alaska. What it means is that cute animals drive up total hits but falsely inflate hit rates and give me a false sense of how much interest there is in skin boats. So if I throw in the occasional sea otter or baby goat in a future post, it will be to investigate whether my theory is correct, or maybe I will just be looking for an ego boost. I know there are blogs out there which handle the resemblance of one thing to another whether it be film stars or funny vegetables or kittens, but just for the sake of convenience, I chose two to display two of these things right here on this blog as a relief from the tyranny of the same thing all the time. 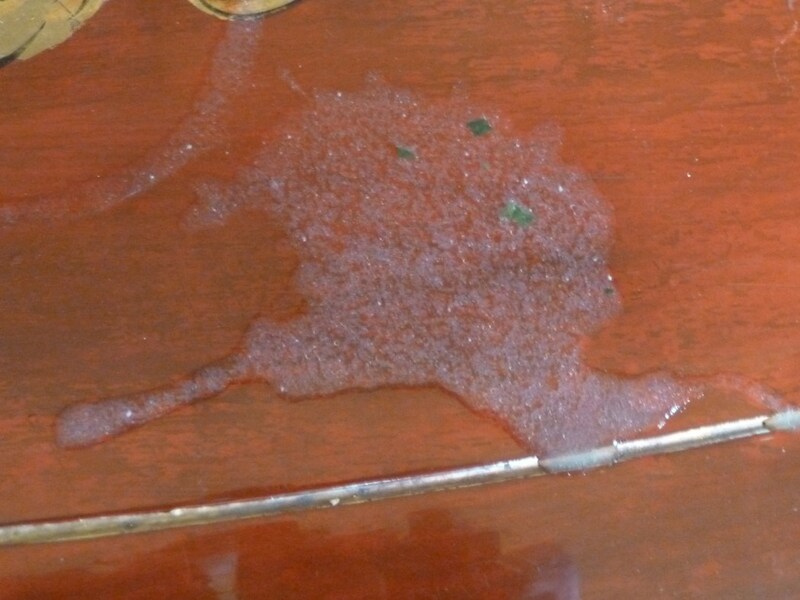 First, a gravy spill that looks like a map of Alaska. Well, sort of, but I think it got pretty close. See for yourself. 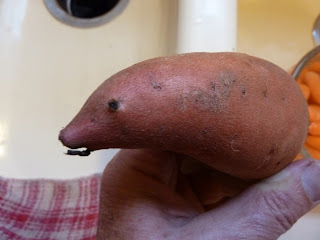 Number two is a sweet potato that looks like a seal. This one you have to admit is good.